The unshaven man leers from behind the high lapels of his trenchcoat, his fingers tented as though to shield a cigarette from the wind. Beside him the neon winks, letters in a loopy vintage font: Bob’s Fine Cars. 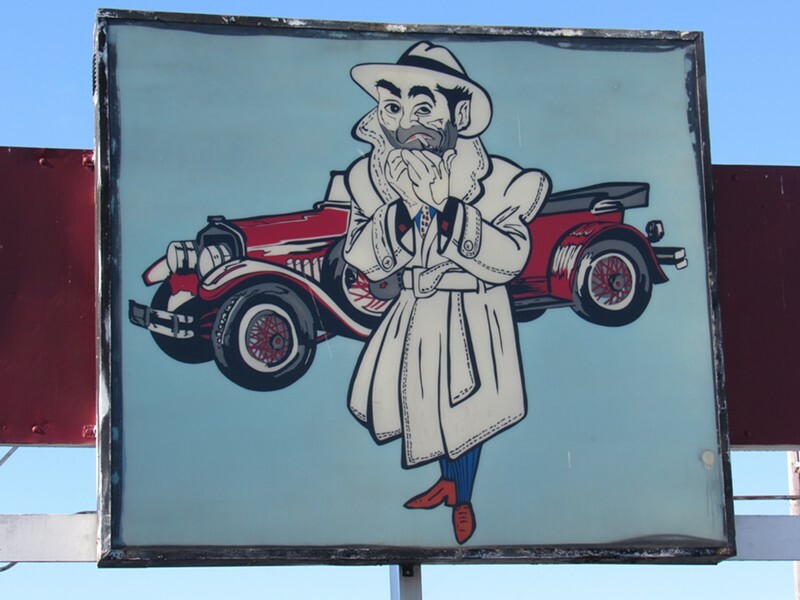 The owner of Bob’s Fine Cars, Bob Crivello, says the logo has been the source of confusion for some, nostalgia for others. People often stop and take photos of the dealership at the corner of Sixth and Broadway, trying to capture a unique piece of Americana. Crivello is the second in three generations to work at the family-owned business, which has been at its current location for 54 years. Right now, he says, he mostly sits around and watches his son Peter work, laughing off questions about when he’s going to retire. The man in the logo is not a shysty, quick dealing lemon-pusher, as some might assume, but what Crivello refers to as a “hood Mafioso character.” And he originates not from the mind of any Mad Men-era marketing committee, but from Crivello’s childhood imagination. In the 1950s, Crivello’s father, Robert Crivello Sr, owned an automobile dealership on Van Ness Avenue in San Francisco. The younger Robert was around 5 when he approached his mother with a cartoon torn out of a magazine, telling her that it “looked just like Dad.” His amused parents made a rendition of the cartoon, tweaking the image a bit, and turned it into the logo for the business. When the Crivellos moved north to Eureka during the region’s boom logging years, the trenchcoated man came with them. So what does the image have to do with selling cars? The dealership will celebrate 55 years in 2016, and Crivello says the office and exterior will be getting "a facelift." The logo will remain.